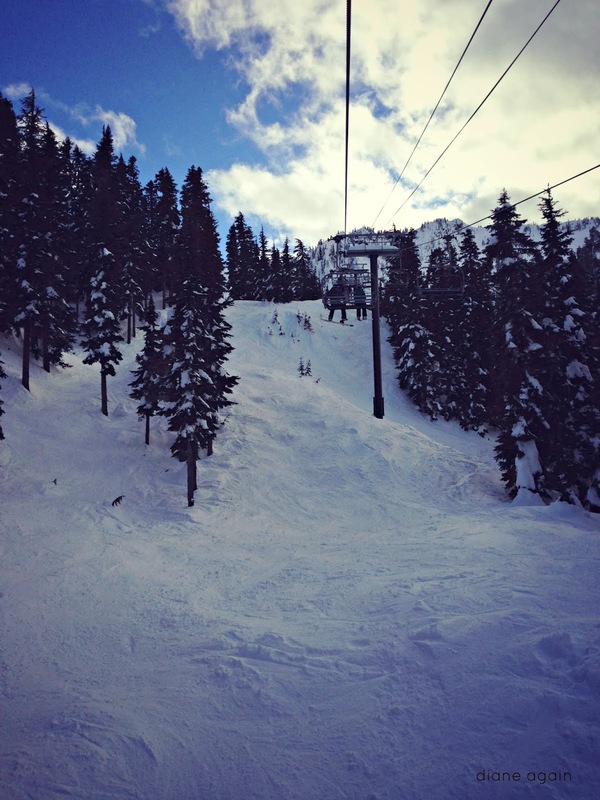 ^ The first chair ride of the day is the sweetest. After the long, stressful ride up the mountain, my troubles melt away and I'm ready to have some fun. 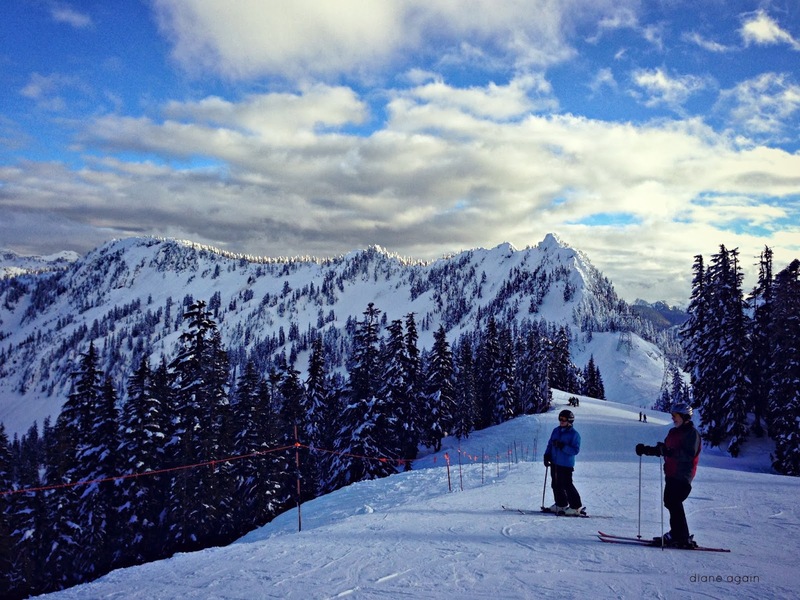 When it comes to skiing and snowboarding, one might assume that all the fun happens on the way down the hill. But as anyone familiar with the concept of gravity could easily point out, that is only half of the experience. What comes down must also go up. Or else it would be a very short day on the mountain. 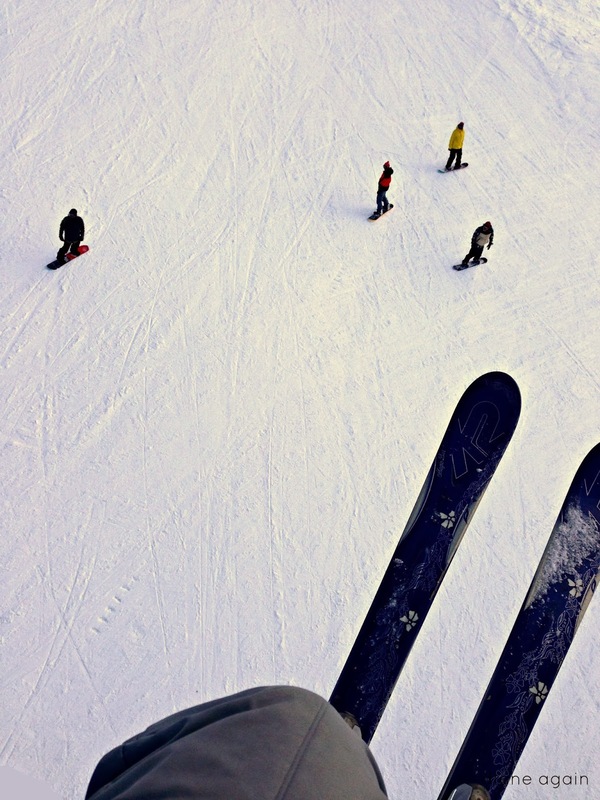 ^ Watching the riders down below can provide endless entertainment from the air. Tonight, I saw not one, not two, not three, but all four members of a posse of teenage boys crash into each other in a series of ridiculous but harmless collisions and fall together in a tangled heap. I was amused, but the guys in the chair behind me whooped and howled in delight. 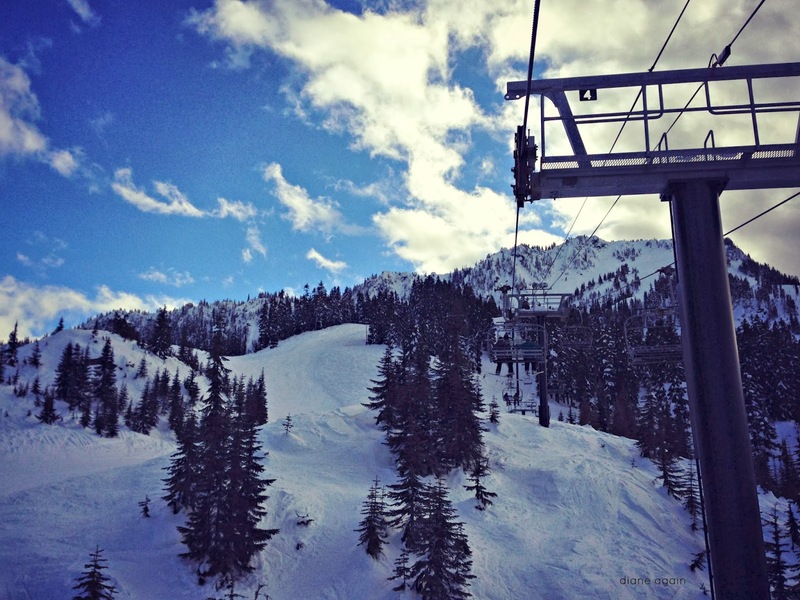 The chairlift is an interesting place, especially when I am skiing by myself as I often do these days. Sometimes I ride up alone, engrossed in my thoughts, of course, but also taking in the scenery, checking out the other riders, and hunkering down for warmth up in the windy heights. 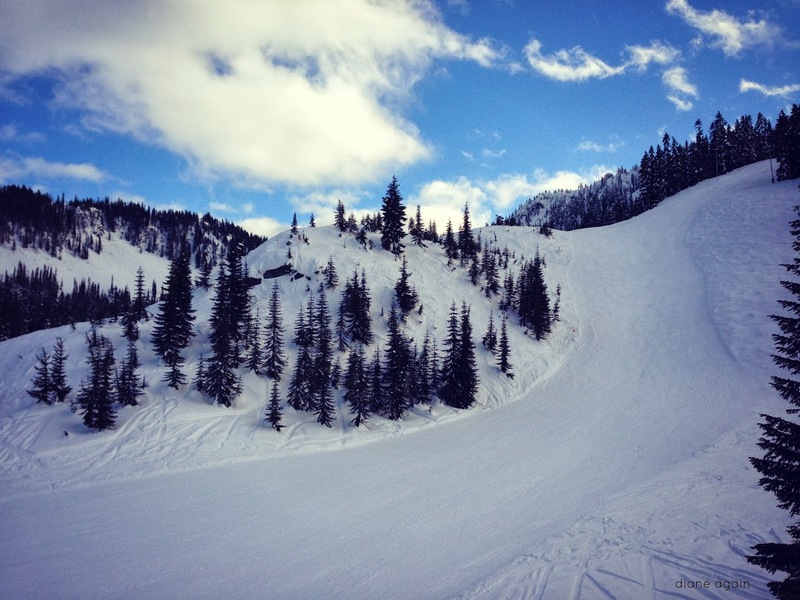 ^ This bird's eye view of Blue Trail and the ungroomed bluff, which my family calls Whiny Trail, fills me with recollections of various crashes and floundering mishaps in deep pow. Oh, the memories. But more often than not, I share the chair with a random stranger. Well. Not really a stranger. On the mountain, we are all friends, and even though that sounds kind of corny and trite, it's actually true. I've never met an unfriendly person on the chair. Oh sure, sometimes we don't talk, but even so, we share a companionable silence. This is especially common when I ride up with a solo teenage boy, as I did today. Adolescents are good at lots of things, but striking up conversations with random moms is not usually their strong suit. ^ "Hi, son. Wanna talk with me about mops?" And sometimes, if my fellow travelers are together, I might listen as they chat between themselves. Tonight, a college-age guy gave his newbie girlfriend, who had apparently just fallen on her face and hit her head, a few solid tips for staying upright. He coached her through a few heel-side versus toe-side basics and then suggested that they head over to her favorite run and make some practice turns to help her master the techniques. He was awfully sweet and patient. ^ This section of the Hogsback chair passes over another great place for observing the passersby down below, and riders up above often offer light-hearted editorial comments. So whenever I ski through here, I try really hard to not crash and burn. Also, I chat with the lift operators who work in the loading zones, making sure everyone stays safe. My favorite liftie works at the base of the Tye Mill lift pretty much every Friday night, and he always has a friendly greeting and an interesting comment. He often gives me tips on which runs are particularly good that day, though tonight, over the course of several rides, we had a spirited if fragmented conversation about his technique for keeping the snow and ice build-up under control in his loading zone. The man knows how to handle a pick ax. ^ Approaching the top of Tye Mill in late afternoon affords these gorgeous stripey shadows. Best of all are the golden moments when I sit down on the chair, say hi to my partner, and suddenly we are transported into an amazing conversation that fills every moment of our ride. For example, tonight I rode up with the man who runs the Ski Patrol. I've shared a chair with him before, and it's always fun to ask him about his line of work. Today, he told me stories about teenagers with broken collar bones, the new tree well safety program, and the daily grind of avalanche control. ^ I trust my life to that one thin cable. 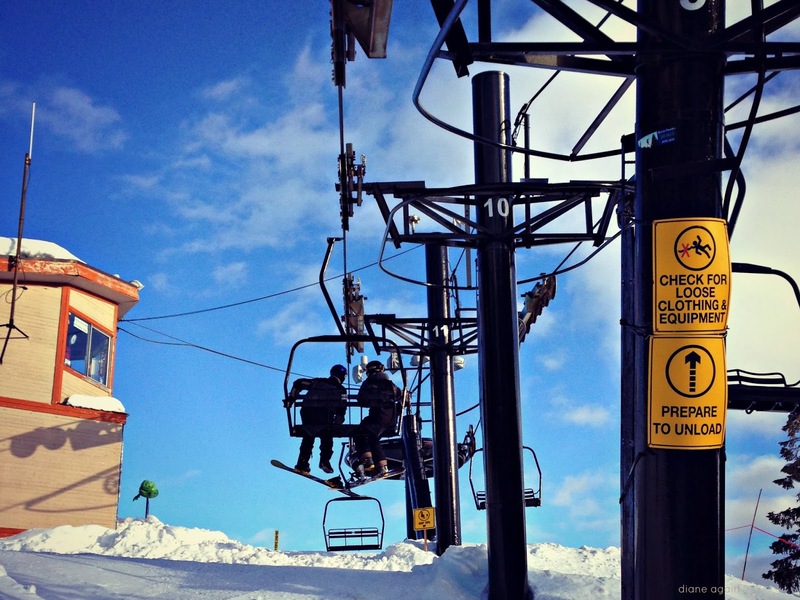 Strangely, I'm never scared on the chairlifts. Even when the chairs rock in the wind. I find it relaxing. 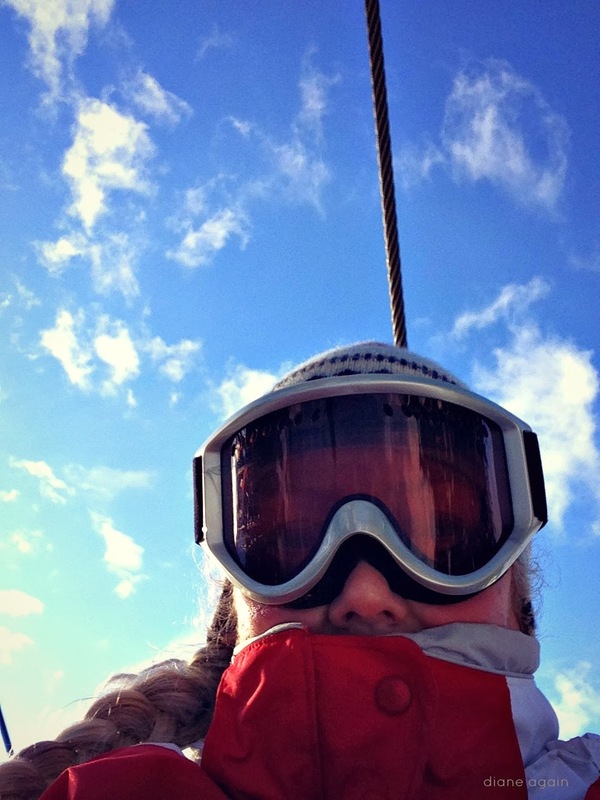 A few weeks ago, I rode up with two darling preteen girls who asked me countless questions about my skiing life, and gave me a full rundown on their day's adventures. 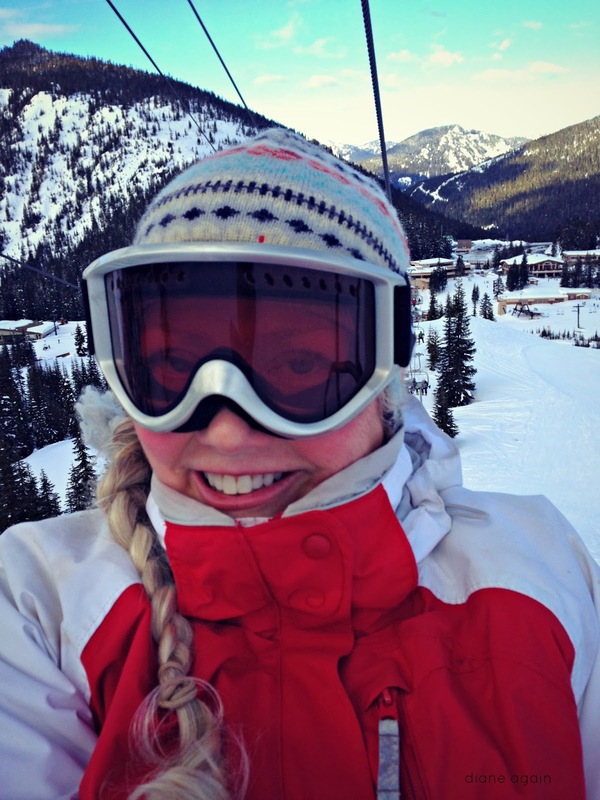 Last month, I met who I'm sure must be the only other solo woman skier on the mountain. We were both rather surprised to meet another woman so feisty and determined as to come up and spend the day skiing all by herself, and by the end of that lift ride, we were bonded. Rarely does it happen that I ride up with the same people more than once in a day. But recently, I ended up with a pair of twenty-something men, two trips in a row. On the first trip, we had mostly chatted about the Seattle Seahawks playing in the upcoming Super Bowl, but at the beginning of the second ride, they were a little surprised to see me. "What are you doing down here already?" one asked me. The other one said, "We ripped that run. So you must have, too." I just smiled. That was a fun moment. ^ When I was in high school, I had a ski jacket with a belt that featured a big rectangular buckle. One warm day when I was skiing, I unzipped my coat and buckled the belt behind me, so that oversize buckle wouldn't flap around. Unfortunately, on the chairlift, the buckle wedged itself between the two horizontal slats of the chair back, and when the time came to stand up and ski off, I couldn't move. That was a hilariously awful moment, and I'm often amused by the memory when I'm getting ready to unload. Sooner or later, though, no matter how enjoyable the ride, the chair always reaches the top of the mountain and it's time to wish each other a good day as we disembark. 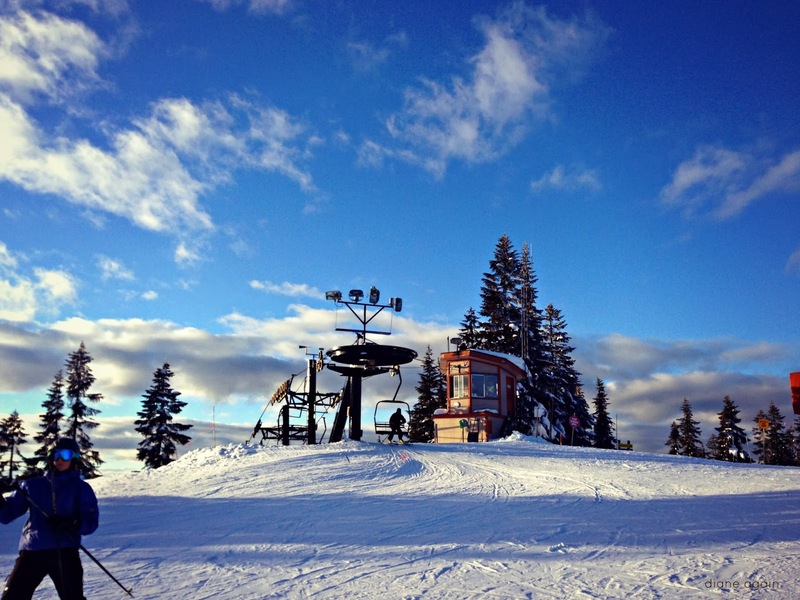 ^ Solo chairlift rider hops off at the top of Tye. Ain't no shame in riding alone. 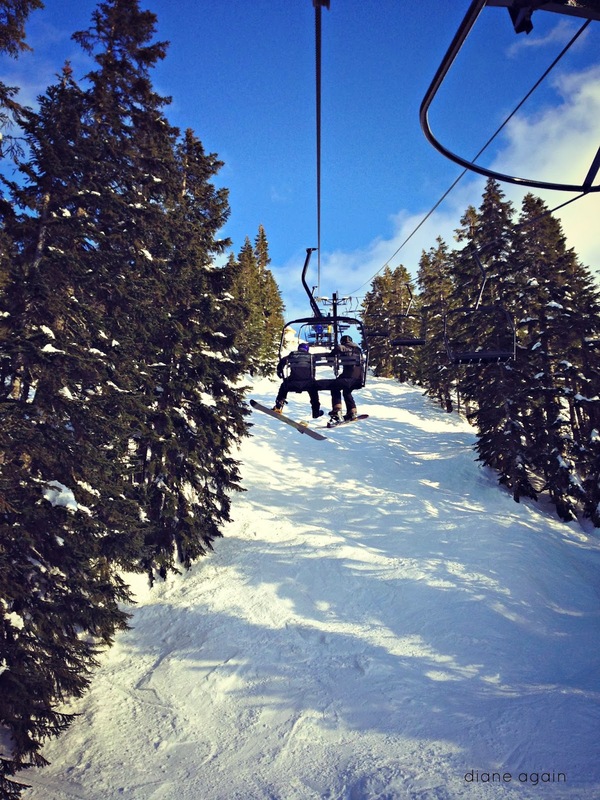 And just as quickly as our bond was created, my chairlift mates and I are parted, as we each take off down the run. ^ Oh hay, random people. You can be in my shot because we rode up on the chairlift together and now we are officially besties. Even as we go our own ways, our kinship remains. On the mountain, we really are all friends, and who knows when we might find ourselves going up together again.